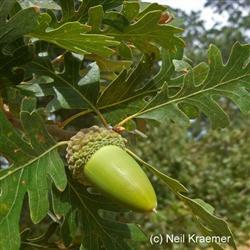 The Valley oaks are large, angular limbed trees that can reach up to 100 ft in height. They display a grayish, alligator -skin like bark that is offset in the winter, when the large, lobed leaves drop to the ground. These trees provide apmle shade in the summer heat and can provide nature with safe, shaded cover.